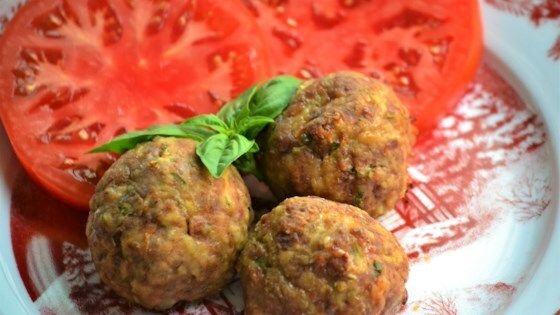 "Turkey meatballs with zucchini baked right in. We make them into large meatballs because they are basically a meal in and of themselves, but feel free to make them into smaller sizes! Also great with pesto and tomatoes!" Preheat the oven to 350 degrees F (175 degrees C). Lightly grease a 9x13-inch baking pan. Heat vegetable oil in a medium saucepan over medium-high heat. Saute zucchini and onion until softened, about 8 minutes. Add garlic; cook for 2 minutes. Remove from heat and let mixture cool to room temperature. Soak bread in a small bowl with milk until milk is absorbed, about 2 minutes. Remove bread and gently squeeze out excess milk. Place bread in a food processor and pulse until mixture forms fine crumbs resembling wet sand. Combine ground turkey with the sauteed zucchini mixture, bread crumbs, oregano, salt, pepper, and nutmeg in a large bowl. Add eggs, Parmesan cheese, and parsley; mix thoroughly. Form mixture into 12 large meatballs using a large ice cream scoop. Place 1/3 cup flour in a shallow dish. Dredge meatballs in flour and place 1 inch apart in the prepared baking pan. Drizzle olive oil over meatballs. Bake in the preheated oven until meatballs are lightly browned on top and no longer pink in the center, 30 to 38 minutes. An instant-read thermometer inserted into the center of a meatball should read at least 160 degrees F (71 degrees C). They were very good! The only thing I did differently is I cooked them longer. I took a bit to make them, shredding zucchini takes a bit?? All in all I’ll definitely make them again!